Don't just pay your ticket, we can help! - If you have received a traffic ticket in Hamilton, or if you have got a ticket anywhere else in Ontario but live in Hamilton, our traffic defence experts in Hamilton can help you fight your charges. Come for a free consultation and we will explain your options to you and how we can help you. Ticket Defenders®* attends in courts across the province on a daily basis. Our first objective is always a complete dismissal of your Hamilton traffic ticket charges, so that you can save your demerit points and protect your insurance rate. You simply will not find a more able team to defend you! If you are worried about having to attend at Court - stop worrying: if you let our experts on defence of traffic tickets in Hamilton take care of your ticket charges, you will never be required to appear in Court. In fact, you are not even required to attend at our office. Of course, we would love to meet you and prefer to, but everything can be completed via phone and fax as well. So, please feel free to phone us if that is more convenient for you. Depending on the questions you might have, the entire process takes only ten minutes. Ten minutes and you will have piece of mind knowing that your matter is being dealt with competently. 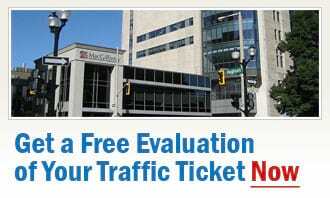 Call our experts on defending traffic tickets in the Hamilton region today for a free assessment of your case. Or, request a free, no-obligation traffic ticket consultation of your situation, and one of our traffic ticket defence specialists will contact you with the answers to your questions. It does not matter if it is accident charges, a Careless Driving or Stunt Driving charge, a Speeding Ticket, or any other Highway Traffic Act offence charges that you are dealing with - we can help you fight them.